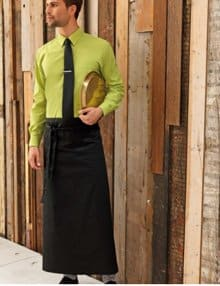 Bar & Restaurant Uniforms - Excellent Choice and Great Prices! A coordinated look for your bar and restaurant staff is easy to achieve, thanks to Bankford’s modern and stylish range of restaurant and bar uniforms. Practicality is at the forefront of every piece, meaning your bar and hotel staff will be wearing a practical uniform which is comfortable every day. Our hospitality uniform range of smart blouses and shirts, casual polo shirts and hard wearing trousers, right through to aprons and shoes will complete the perfect look which is suitable for any pub, restaurant or hotel. Shop Online > Uniforms > Hospitality Uniforms and Catering Clothing > Bar & Restaurant Uniforms - Excellent Choice and Great Prices! We know that first impressions count, and you want your staff uniform to look as professional and presentable as possible, without breaking the bank. That’s where Banksford can help, with a catalogue which covers every uniform item we think hoteliers need to keep waiters, bartenders, and front of house workers smart, comfortable, well presented, and ready to assist your customers. Working in any sort of restaurant or pub, you’re sure to know the importance of impressing customers, and that starts from the minute they’re greeted by the first member of staff on your time. A Banksford supplied uniform is a fantastic way to make sure that staff are dressed to impress, making the right impression on your valued customers, regardless of whether you’re running a quiet country pub or an inner city Michelin starred bistro. Of course, it’s important to keep staff comfortable, which why there are so many options which will keep staff happy during their shift behind the counter or on the restaurant floor. Choose from breathable separates in a huge range of colours and fabrics, perfect for hotel and restaurant wear. Whatever uniform choices you make from the extensive Banksford online catalogue, you can be sure that your staff will give customers the right impression. We’ve got options from the industry’s top manufacturers, like Denny’s, Premier Workwear, Alexandra and Kustom Kit. Keep ahead of your competition with a uniform supplied by Banksford.